Crusty,puffy eggless donuts are great evening snacks! My four year old loves to pick up a donut as a treat once he finishes his homework.And its divine taste is a true reward for him. You all can prepare them at home with this easy and addictive recipe. Add warm water and sugar to yeast and let it stand undisturbed for 10 to 15 minutes. Heat milk ,castor sugar and butter in a pan till its lukewarm. Take a bowl.Add flour,salt and yeast mix to it.Now slowly pour milk mix in the bowl and start whisking. Beat well everytime you add milk mix.After a while you will have to use your hands to start kneading the dough.Knead the dough well for 5 minutes till it is soft. Let this dough rest in a greased bowl for 1.5 hours.Cover the bowl with dry kitchen towel. The dough will rise after1.5 hours.Dust some flour on kitchen counter.Start rolling the dough till you get a sheet of 1" thickness. Cut this sheet with donut cutter or with two bottle caps till you get desired shape. 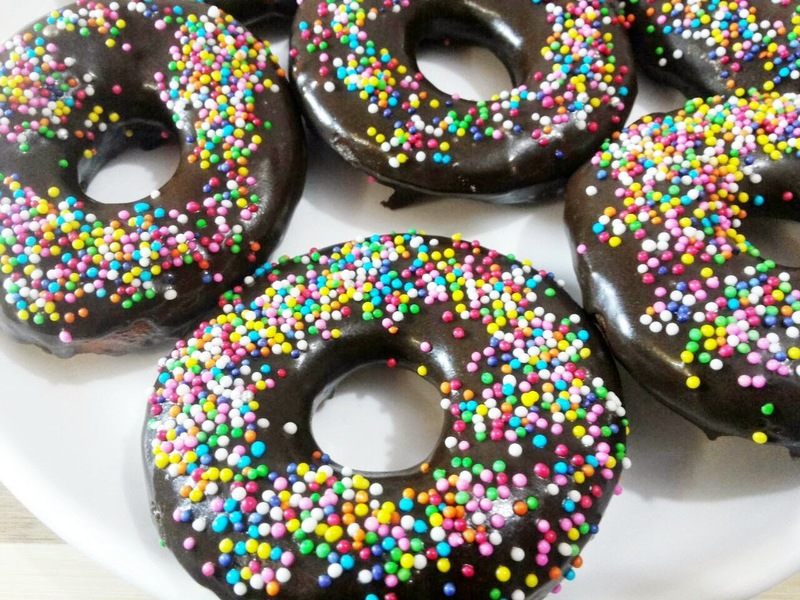 Heat vegetable oil in a thick bottomed pan on medium heat.Start frying 2 to 3 donuts at a time in the oil.Donuts should be thoroughly cooked from inside too.Once they are golden brown in colour,take them out of pan and onto the absorbent paper.Fry all donuts in the same way. To make frosting,take a bowl.Beat butter and icing sugar together till mixed well.Add cocoa powder till its absorbed well.Now add vanilla essence,cream ,lukewarm milk till you get flowin g consistency. 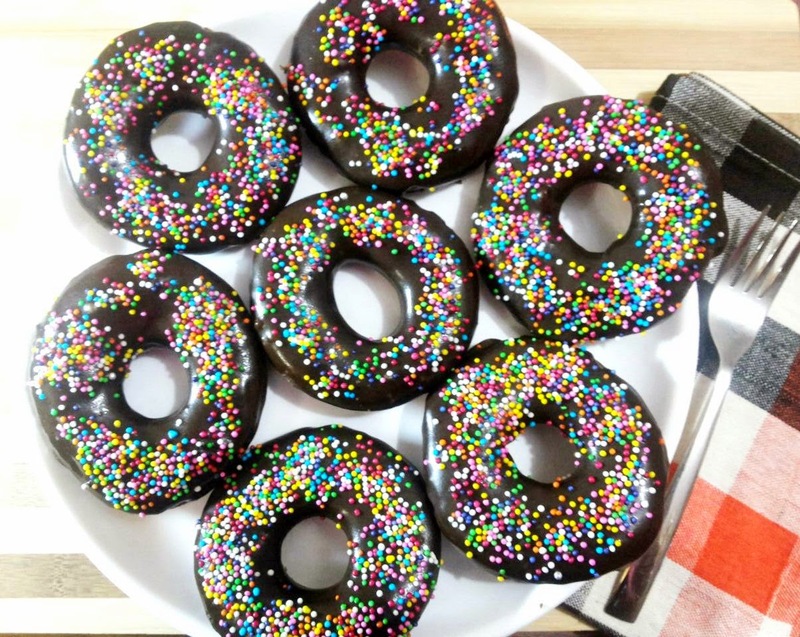 Now for glazing,dip cooled donuts in frosting and place them on wire rack for drying.Simultaneously spraed rainbow sprinkles on wet donuts so that they stick well. 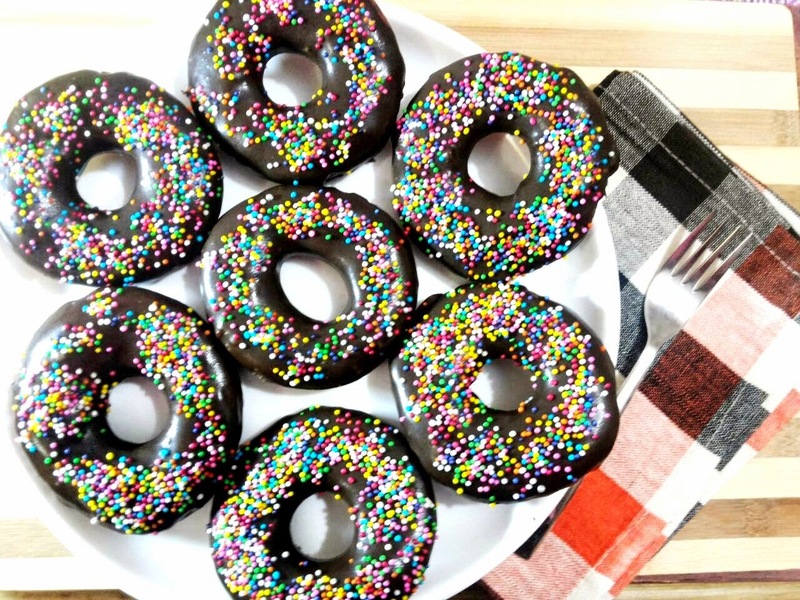 Serve the donuts hot.You can store unglazed donuts in fridge for 2 to 3 days.